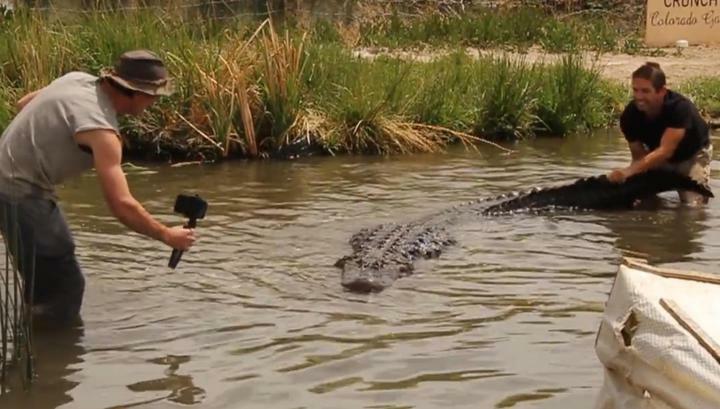 A four-hundred-gram alligator named Bruce Almighty could easily turn into a bloody reality show with a farm owner in the US, where he has been living for 22 years. Men during the shooting for The Wild Charles Show it seemed that the reptile gained excess weight, but because they decided to drive it, while directing a report on Facebook. Alligator training, implying the dragging of his tail and head turns then to the right, then to the left did not appreciate what the “mentors” let know. He did it the only way he could understand it – by attacking the owner of the farm and the first aid center in the Alamos district in Colorado. Powerful jaws closed about a centimeter from the hand of a man. “He did not reach me, so everything is in order,” the operator reassured his viewers, much surprised that the phone on which the recording was also not affected. On this, however, communication with Bruce Almighty, whose length exceeds 3.6 meters, the creators of the tape decided to stop.